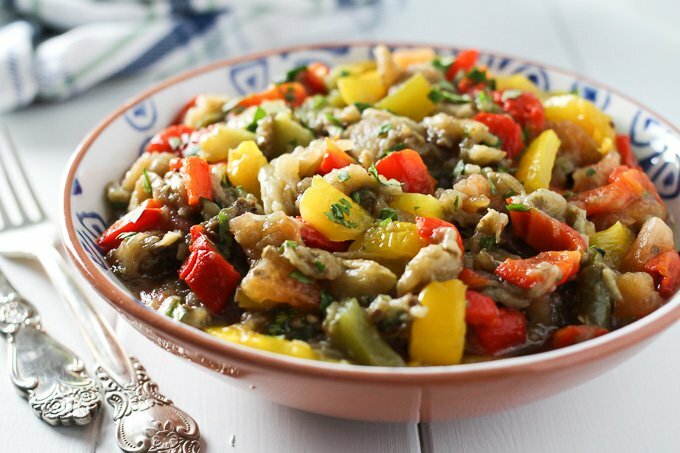 This roasted eggplant salad is made with bell peppers, tomatoes, fresh herbs, olive oil and, lemon juice. 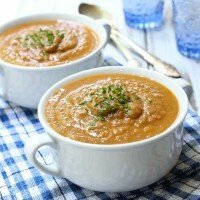 You can serve it warm or cold as a side dish, salad, or appetizer. 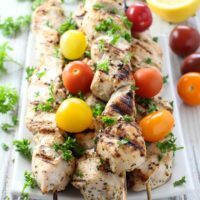 You can also add it to sandwiches and wraps. Although eggplants are in season from August to October, they are usually available year-round at grocery stores (at least here in Toronto). 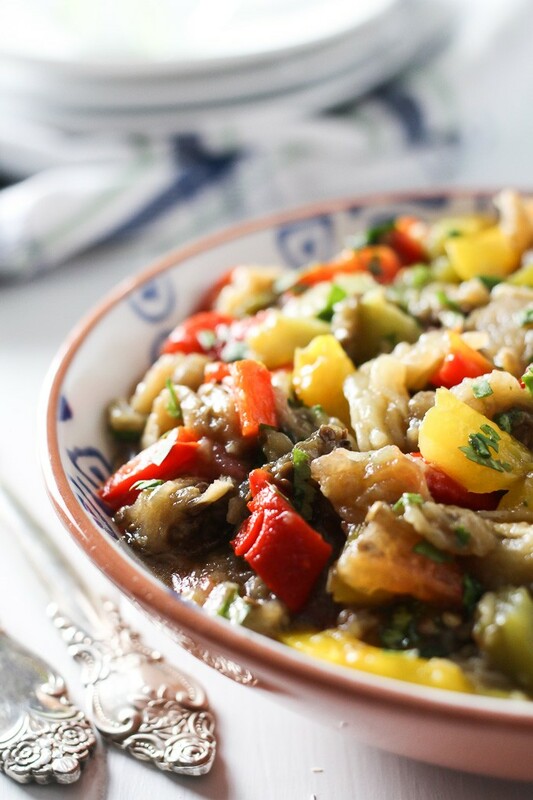 Whenever my grocery store has a sale on local produce, I buy a lot of tomatoes, eggplants, and bell peppers and make this Mediterranean roasted eggplant salad. 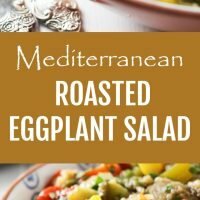 This salad is very easy to make even though it takes a bit of time because you have to roast the veggies and then wait for them to cool off before finishing up the salad. So, make sure to plan for that if you decide to try it. Be especially careful when handling roasted tomatoes because the juice inside of the tomato might be very hot even though the tomato feels cool enough to handle on the outside. 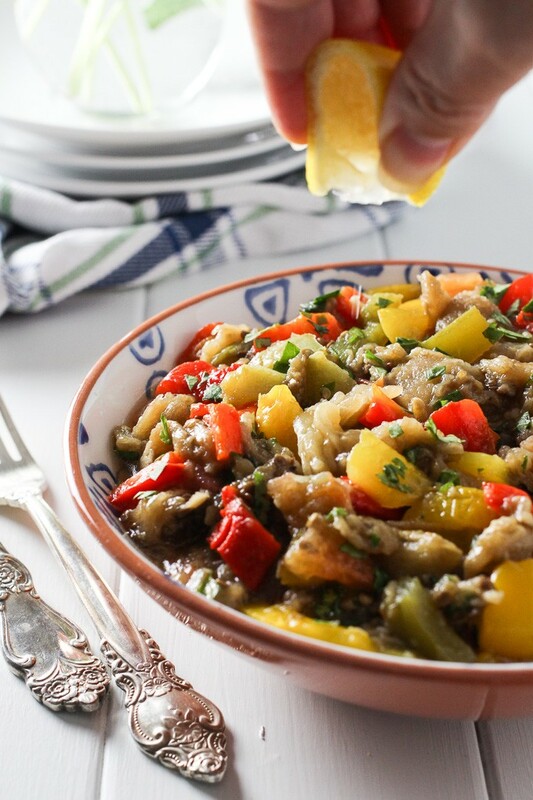 You can also make a grilled eggplant salad using this recipe. 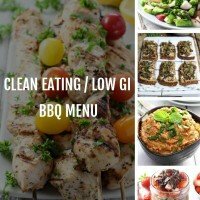 Just grill the veggies instead of roasting them. 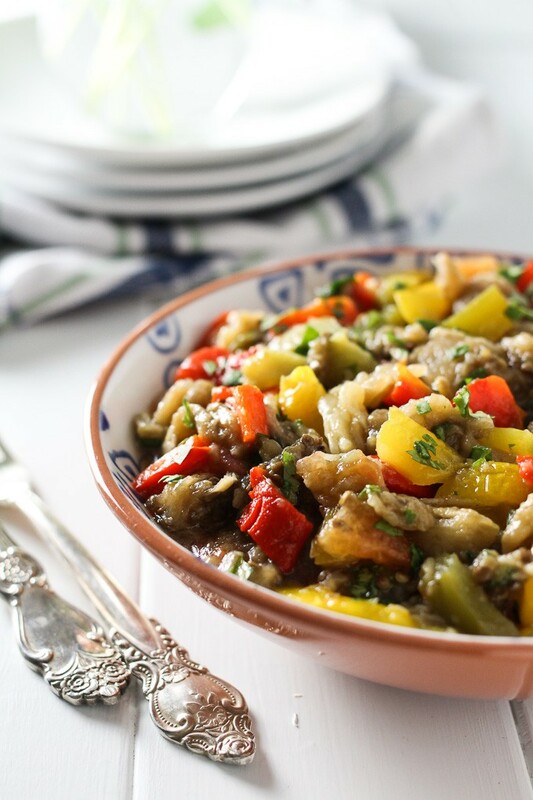 This roasted eggplant salad is also very versatile. 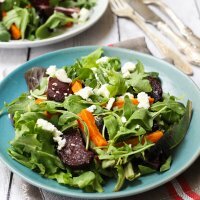 Just add some feta, garlic, and olives and you’ll have a totally different salad. You can also try adding some pomegranate seeds too. 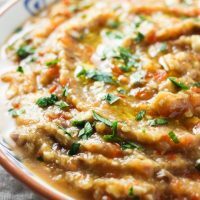 If you are looking for more eggplant recipe ideas, try this Roasted Eggplant and Feta Dip and this Eggplant Vegetable Soup. 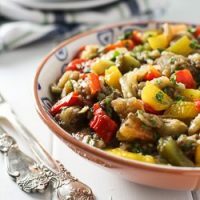 This simple and healthy Mediterranean Roasted Eggplant Salad can be served warm or cold and tastes great as a side dish, salad or appetizer. You can also add it to sandwiches and wraps. Cut the eggplants in half lengthwise. Place on a cutting board sliced side up, sprinkle with salt and leave for 30 minutes. The eggplant will release some moisture which helps to get rid of the slightly bitter taste typical for larger eggplant varieties. (You don’t have to do this if you don’t mind the bitter taste. Some people are more sensitive to bitter taste than others. I, for example, cannot handle it so I always sprinkle eggplant with salt before cooking). Oil a baking sheet with a little bit of olive oil. Place the eggplant halves on the baking sheet sliced side down. Place the baking sheet in the oven and roast for about 10 minutes. In the meantime, cut the bell peppers in half and clean out the stems and seeds. Most likely, you won’t be able to fit all the veggies on one baking sheet. So put the bell peppers skin side up and tomatoes on another baking sheet and place it in the oven as well. Roast the vegetables for another 50 minutes or until the veggies are soft and bell pepper skins start to char. Remove the baking sheets from the oven. Leave the eggplant on the baking sheet to cool. Transfer the bell peppers and tomatoes into a bowl; cover the bowl and let the veggies cool. This makes it easier to peel the skin from the bell peppers and tomatoes. Once cool enough to handle. Scrape the eggplant flesh onto a cutting board and cut into chunks. Pour half of the lemon juice over the eggplant and transfer to a salad bowl. Remove the skin from the bell peppers and chop them into bite-size pieces. Remove the skin and seeds from the tomatoes and chop them as well. Add all the chopped veggies to the eggplant. At this point, you might notice that a lot of liquid was released from the veggies into the bowl. I prefer to drain some of the liquid. Add the rest of the lemon juice, 1 tablespoon of olive oil, chopped cilantro and basil. Season with salt if desired. Mix everything to combine and serve. 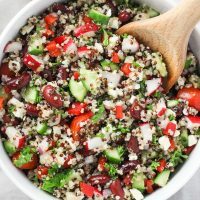 This salad is delicious! Although, it did take time to make it but was totally worth it!